Villa Kep Resort is ADULTS ONLY Resort and welcome Guests 16 years old and above. Maximum two (2) persons is allowed to accommodate in a one (1) room. For special arrangement, please contact sales@villakep.com well in advance. After the reservation is confirmed, the guest can cancel the reservation according to fare rule that is clearly mentioned above in the reservation. If reservation will be cancelled or modified less than 7 days before the arrival day or in case of no-show, the full value of reservation will be charged. Peak Season cancellation policy valid on 20.12-04.01 and 15.02. - 18.02. After reservation is confirmed, the guest can cancel the reservation free of charge not later than 90 days before day of arrival. If reservation will be cancelled or modified less than 90 days before the date of arrival, 50% of the reservation value will be charged. If reservation will be cancelled or modified less than 60 days before the date of arrival or in case of no-show, the full reservation value will be charged. Credit card is required to confirm and guarantee all reservations. Payment will be charged upon arrival. Deposit is not required, but Resort keep right to block reservation value according to cancellation policy. Your security is important to us. We offer a secure website to process your information and take steps to maintain your privacy. For group reservations (more than four 4 rooms) above cancellation, payment and deposit policy not apply. Please see attached group reservation policy. This newly renovated holiday paradise is nestled in tropical greenery and ideally located between the sea and the Dâmrei mountain range in south west Cambodia. 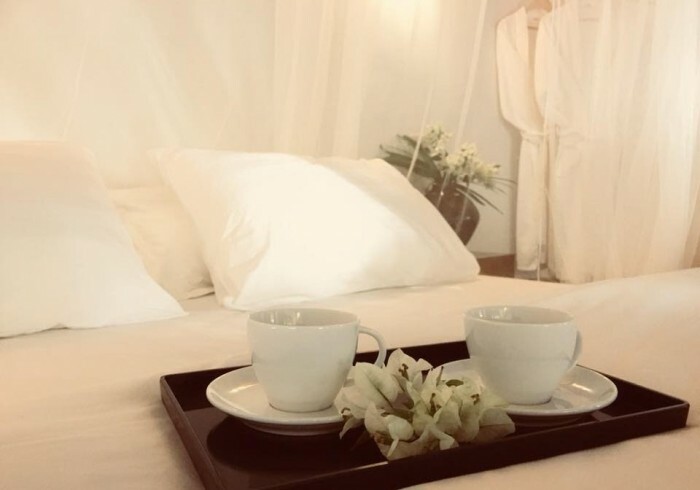 The resort is neighbor to the stunning Kep National Park, whilst being just five minutes Tuk Tuk taxi drive to the famous local Crab Market and the tree lined golden sands of Kep beach. Set in tranquil gardens brimming with exotic flowers and fruit trees, Villa Kep Resort boasts a luxurious swimming pool and Bamboo pool bar. And as its name suggests, the resort’s Sunset Lobby terrace provides the optimum viewpoint to enjoy the daily magic of the setting sun. And why not enjoy a sundowner before sampling the dishes of our restaurant, which serves a variety of both Cambodian and European dishes. The 18 spacious air-conditioned garden villas each have private terraces. They also have modern bathrooms and personal fridges. Guests also have the free use of high-speed Wi-fi throughout the resort. Resort operates a 24-hour reception service. Friendly staff is on hand to assist with wide ranging information of the surrounding area and arrange tours, beauty treatments, and bicycle or motorbike rental for the guests. Villa Kep Resort located in the coastal area of Cambodia, close to the Vietnam border. The area offers diverse attractions including pepper farms, salt fields, National park and mountains, rice and fruit plantations, caves and Buddhish pagoda, snorkeling, tours to the beautiful Rabbit Island or even to Phu Quoc Island in Vietnam. Resort is Adults only and cannot accommodate Guests under 16 years.